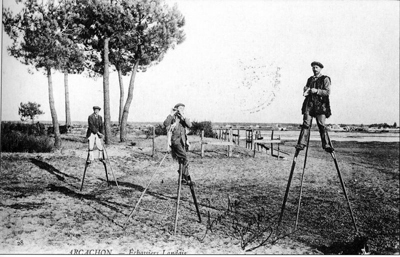 Because the Landes department was so damp underfoot, before the creation of the Landes forest, the shepherds used to watch their flocks whilst wearing stilts! The extra height in the flat landscape also gave them advance warning of the arrival of wolves. Wrapped in huge sheepskin coats, with sheepskin boots on their feet and perched on two stilts with an enormously long shepherd's staff, they looked like some alien life form, and frequently startled unsuspecting visitors from outside the area.